↑ Srivastav, P.K. ; Tayal, M. K. (2017). Virtuous Plants. ଦରିଆ ଗଂଜ, ନୂଆ ଦିଲ୍ଲୀ: Scientific Publishers (India). p. 117. ISBN 978-93-86102-83-6. Retrieved 26 August 2018. 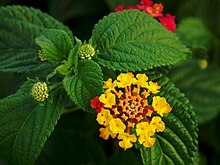 ↑ "Lantana Camara- Devouring the Forests of India". Geography & You. Retrieved 26 August 2018.